Experience another update from the Cyanogenmod team as Cyanogenmod 7 Alpha reaches HP Touchpad. The crowd in Cyanogenmod shows us their progress in developing new tablet experience for their fans. Surely, this is another good news for the techies. 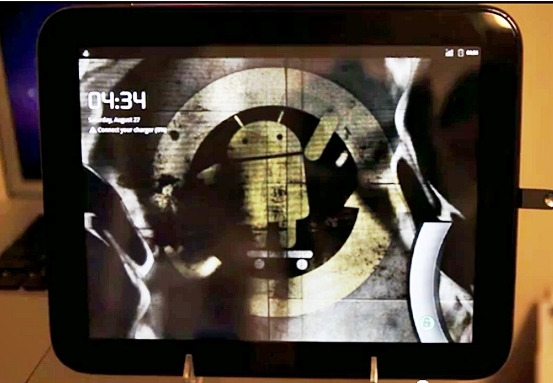 Now, they are in progress of creating a dual-boot solution for Android running device on HP Touchpad. Here’s the latest video as the Cyanogenmod team boasts their two major updates – bluetooth connectivity (for audio) and Netflix. In the video, you will see a short flash of the boot loader of the device. It allows you to boot either on CyanogenMod7 or webOS. There are also other available options, such us booting into the webOS recovery or ClockworldMod. Watch the video and explore what is in store on Alpha. For the first part of the video, you can tilt your head if you want to read the booting process. Then, you’ll see the Cyanogen Logo, as it loads. The Green shows off Bluetooth’s connectivity. You’ll hear a ring tone being played on the Touchpad through the cool Sony Rolly speakers which you will see on the left side. It’s awesome, guys. Then you’ll see Netflix support, while being demonstrated. While watching, I must admit it’s hype, it’s another movie experience. It was mentioned from an article from Precentral that the Cyanogenmod team asked the assistance of the webOS internals team. The webOS internals are responsible in the webOS homebrew and Preware which is the webOS homebrew installer app. The homebrew apps and patches are considered above board unlike on iOS. With that, they don’t avoid the homebrew apps to from running whenever there is a firmware update. HP has folded some updates on performance codes from the webOS internals to the official builds on the firmware of webOS. It’s a great idea that Cyanogenmod 7 has teamed up with the webOS Internals, considering their expertise on webOS, but still we’re not sure long the two group had been working together. If you’re itching to try the new update, be reminded that this is an Alpha release. Your device might experience few bugs that the team needs to fix. Some of the bugs include the sleep mode which doesn’t actually work in Android, so there’s a possibility of constant drain on your battery. Another bug is when you plug your headphones the audio plays through the headphones, but there’s a problem on Touchpad speakers, it doesn’t mute them. These are just simple bugs that need some fixing by the team, but if you have the guts to try it, and install the new update, it’s your call. Enjoy the BT and Netflix update.